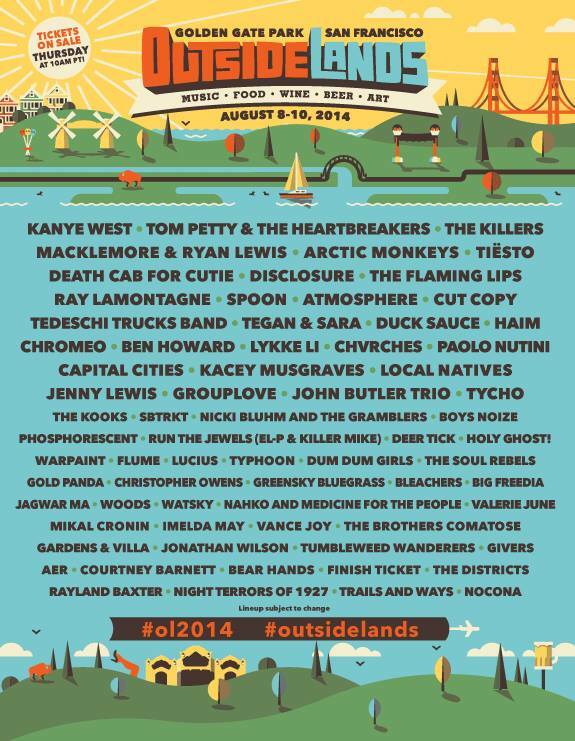 San Francisco’s Outside Lands has revealed its lineup for 2014. The three-day festival takes place at Golden Gate Park from August 8th – 10th. Kanye West, Tom Petty and the Heartbreakers, and The Killers top this year’s lineup, alongside Arctic Monkeys, Death Cab for Cutie, The Flaming Lips, Spoon, Macklemore & Ryan Lewis, Tiësto, Disclosure, Cut Copy, Lykke Li, HAIM, CHVRCHES, Chromeo, Tegan & Sara, Ray LaMontagne, and Local Natives. Other confirmed acts include Phosphorescent, Run the Jewels, Warpaint, Jenny Lewis, SBTRKT, Deer Tick, Grouplove, Atmosphere, The Kooks, Tycho, Holy Ghost!, Flume, Dum Dum Girls, Kacey Musgraves, Capital Cities, Paolo Nutini, Christopher Owens, Woods, Courtney Barnett, Mikal Cronin, Gold Panda, Typhoon, Lucius, Big Freedia, Jagwar Ma, Bear Hands, Gardens & Villa, Nicki Bluhm and The Gramblers, John Butler Trio, Ben Howard, Duck Sauce, and Tedeschi Trucks Band. Tickets will be available Thursday, April 10th at 10:00am PT through the festival’s website. Update: Watch Huey Lewis deliver the news. Literally.